Our brand new 3 story building features a fully equipped kitchen for guests use. All of our dorm room beds feature reading lamps and surround curtains to ensure privacy and a sound nights sleep. Breakfast is included daily at no extra charge for all of our guests. Our aim is focused on making your experience in Baños the most enjoyable possible and exceeding all your expectations. Come check it out for yourself! You will be surprised with an incredible view of the mountains and waterfalls from our balconies and communal terrace restaurant and breakfast area. We offer comfortable facilities with a high level of service. Breakfast is included for all our rooms. Holy empanada!! This is the place to be. Yeah it’s clean and secure and everything else you need but the real kicker is the people: the people working here are dooooope! 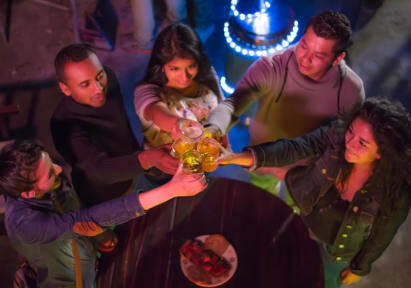 And that perpetuates a culture of care, fun, and respect that is sure to turn any trip to Banos into an experience of a lifetime. Papachos 100%, 10/10 recommend. Great place to stay at edge of small town with roof deck views of green hills and waterfall. Clean modern building with new furnishings, lots of space, friendly atmosphere to meet other travelers, helpful staff. 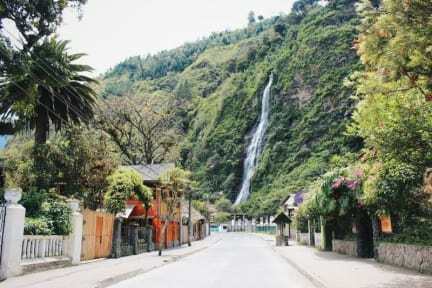 Baños is great town to relax or do “adventure trips”, real hot thermal hot pools. Green hills and fields all around. Staff were all really friendly and helpful. Location is good, it’s about a 10 min walk to the bus terminal and center of town. Price for dorm was really reasonable considering it includes breakfast which most other hostels don’t. Breakfast was eggs bread fruit and coffee. Nice living area and atmosphere. Only downside was WiFi didn’t work in our room but no other issues. The staff was lovely. The private room we got only had a door with a taped doorknob hole for a wall to separate us from the dorm. A bunch of people in the dorm next door were drunkenly banging on our door at 2-3am because they thought it was funny, so we woke up and weren’t able to fall back asleep. If you ask for a private room, be careful. It’s loud and not that private. Otherwise great place and breakfast. Overall a really good hostel. Close to cheap places to eat, a laundry service (which was really good) and the supermarket this is probably the best way to stay in Banos. The hostel offers tours at the desk and has a decent breakfast available everyday. The hostel is also very clean, they have cleaners that come in every day to clean the floors and bathrooms. Only complaint would be the size of the kitchen and the amount of people trying to cook, altho if you cook early it’s not busy. Really disappointed with this hostel. While I was there the atmosphere was completely dead and the staff didn’t organise anything for the guests. I also found them unhelpful when it came to any advice (directions etc). The breakfast was bad. Because the hostel is tiled and a lot of rooms are by the kitchen I was woken up so early every morning (and I’m a heavy sleeper). WiFi was only available in the common areas. I really didn’t enjoy this place and if I hadn’t prebooked I would have left.